SAP FI document types are used to record various business transactions in SAP FI. SAP has delivered many standard document types but new document types can also be created as per the requirement of a company. Document types help organizations in identifying and analyzing business transactions. 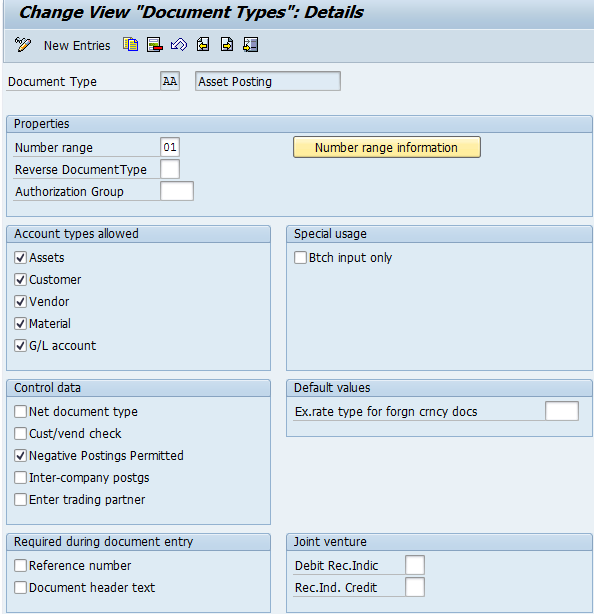 For example, a document type DZ indicates customer payment, D is the account type of the customer and Z indicates payment. Document Type Key is used to distinguish between different business transactions and to classify the accounting documents. It is also used to determine the number range for documents and account types such as asset, material, vendor, etc. for posting. The configuration screen contains a number of fields and we will discuss them one by one. Number range objects, reverse document type and authorization group configured in the properties section as explained below. Number range object will be maintained at the document type level. Number ranges will be maintained at the company code, fiscal year and number range object level. If number ranges are maintained at the company code level, then it is not possible to use the document type. Reverse document type maintenance is optional. If no document type maintained, then the posting and reversal document types will be the same. If a different document type required for reversals, then this field to be maintained and number ranges also to be maintained at the company code level. It allows to restrict the document type for specific objects. Restriction of account types mentioned below are at the client level. By selecting this checkbox, a document type allows asset transactions. By selecting this checkbox, a document type allows customer transactions. By selecting this checkbox, a document type allows vendor transactions. By selecting this checkbox, a document type allows material transactions. By selecting this checkbox, a document type allows G/L account transactions. It is not mandatory to choose all the account types or specific account types. As per the requirements of a company you should choose respective account types. It helps to restrict or apply the following checks. This checkbox is applicable only for accounts payable to deduct cash discounts while booking invoices. It is optional. To restrict either multiple vendors or multiple customers in a document this checkbox to be selected. It is also possible to post multiple line items to the same vendor. By selecting this checkbox, the SAP systems helps to reverse incorrect postings for each item to remove the effect on transaction figures. To be selected to allow intercompany postings. To be selected to allow manual input of a trading partner while booking transactions. Fields enclosed below can be marked as mandatory at the document type level. By selecting these checkboxes, reference number and document header texts fields will become mandatory fields. It is also possible to maintain these fields as either optional or required at the G/L account field status group level. To restrict document type only for batch input postings, this checkbox to be selected. For example, if a document to be restricted for manual postings and to allow only batch input postings, then this check box to be selected. Exchange rate type ‘M’ fetches automatically while booking any transaction. 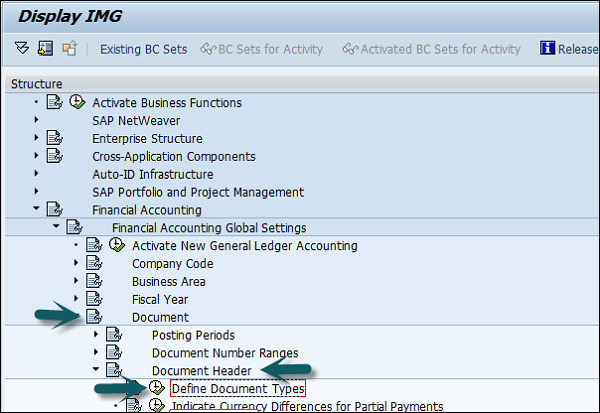 To overwrite this, we can specify the exchange rate type at the document type level, so the SAP system will not use ‘M’. If the exchange rate type is not maintained, then the SAP system fetches the exchange rates maintained at ‘M’ level by default. These checkboxes are applicable for joint venture accounting only. To share incurred costs, these indicators to be defined at the document type level. The costs will be settled through periodic settlement. Document Type − Unique 2-digit code. Number Range − Number Range Code. Reverse Document Type − Reverse Document Type Key Code. Number Range Information − Number ranges are maintained for document types. Account Types allowed − Asset, Customer, Material, Vendor, and G/L Account. Control Data − Control data for document type.